A unique twist on a classic, the same beautiful Alice, wearing a red dress instead of her classic blue dress, new in 2013, order soon, they will be going quickly..
We are pleased to share "Alice in Wonderland-Red Dress" from the Storyland Collection from Madame Alexander. 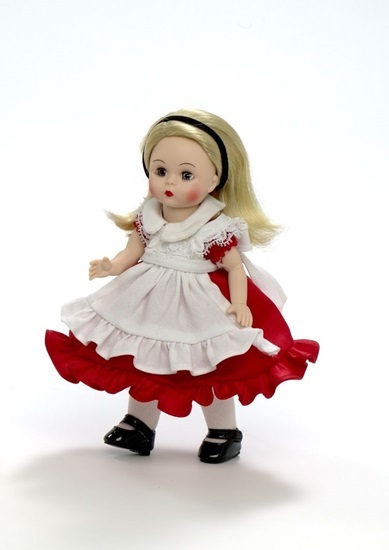 This is an 8-inch fully-articulated Wendy with brown eyes and side-parted long, ivory blonde hair that is held by a black velvet headband. Instead of wearing her classic blue cotton dress , she has changed into a dress of red, crepe-backed satin. The bodice and short, puffed sleeves are made from the satin side of the fabric while the full-skirt features the crepe side of the same fabric. A white collar and apron, with ruffled hem, add a nice counterpoint to the red. A white lace-trimmed petticoat, white pantyhose, and black patent Mary Janes complete this unique and wonderful ensemble.